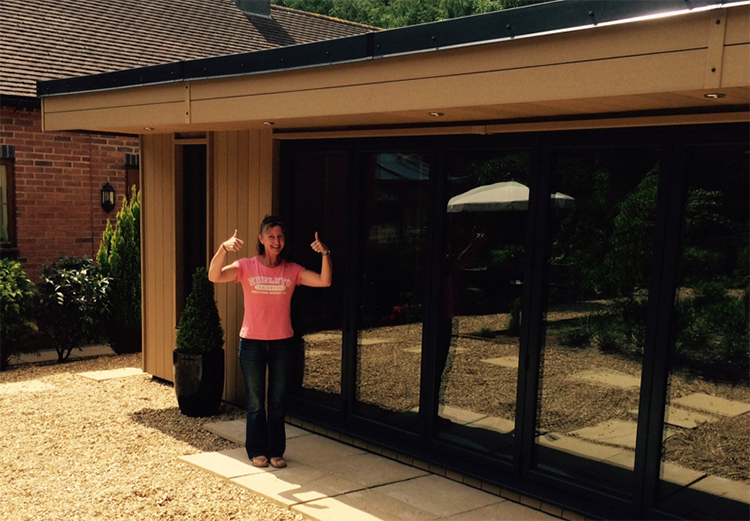 Fitness fans Colin and Clare White from Leicester splashed out on their new fully insulated Garden Room to house the ultimate swim spa. The garden room in the grounds of their stunning Leicestershire property was specially ordered to house a state-of-the-art plunge pool with Jacuzzi style seating and chill-out areas. 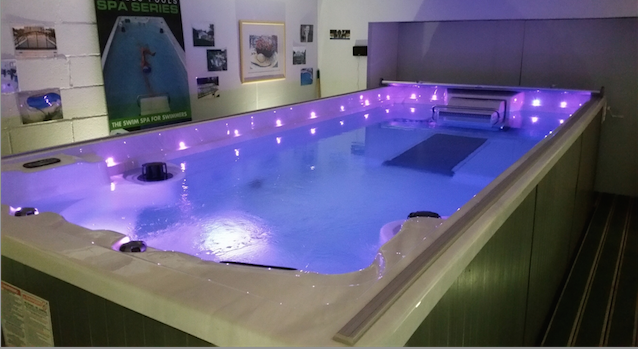 The pool is also fitted with a strong counter current and underwater treadmill for the best in aqua fitness training. Super-insulated, and with a constant pool temperature of 29 degrees, the 40 square metre maintenance free Garden Room is comfortably warm all year round, while the wide bi-fold doors make the most of the view across the garden of the couple’s barn conversion home. Installing the pool house was a design challenge for Rubicon Garden Room Managing Director John Lyon. The humidity and warmth required specialist insulation and waterproof plasterboard, while all the electrics for the building had to be housed in a separate room. However, the Rubicon team rose to the challenge and Colin says they were a pleasure to work with from beginning to end. 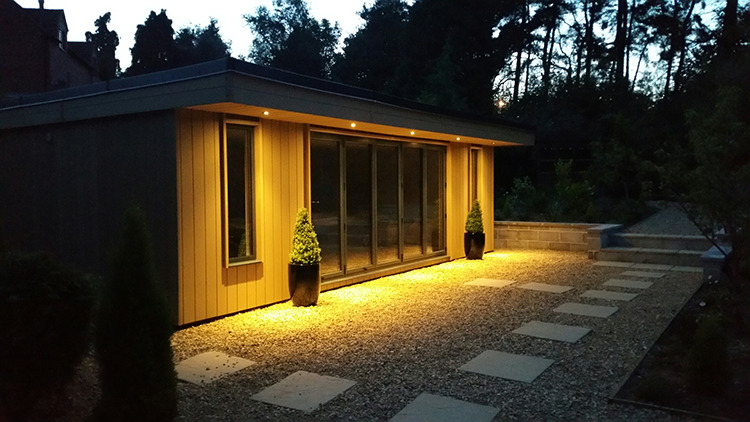 “We decided to go with Rubicon Garden Rooms because the company’s buildings use Wood Fibre composite material, which means there will be absolutely no maintenance. “It is brilliant. We’ve got exactly what we wanted and once they were on site it took the installation team just two weeks,” Colin said. “As the pool weighs 1.5 tonnes - without the water - a specialist company came in to put the foundation down. After that Rubicon had to make a few changes along the way because of the specifics of the building but they just adapted and got on with it. The couple say they have both seen the health benefits of having it already, thanks to their fitness regime - Colin, an aerospace engineer for Bosch, spends time in the pool at least four times a week. “I’m in lot better shape already,” said Colin, aged 42. “It is so much more convenient than having to go to the swimming baths – which are never the nicest places anyway. Having your own pool in a Garden Room means you don’t have any excuses. Having always enjoyed swimming and running, the five metre by two-and-a-half metre pool allows him to combine both for the ultimate workout. “It has an underwater treadmill so I normally run for about 45 minutes and then have a 20 or 25 minute swim against the current so it is pretty full on. The addition of a luxury Garden Room to their home is not all about hard work for Colin and Clare who can also relax in the water with the Jacuzzi bubbles on or recline on the two deluxe sun loungers that complete the furnishing of the pool house. “All the walls are fully tiled which looks really smart inside, and the outside sits really well in the garden. We’ve had a lot of great comments from neighbours,” said Colin.